Saturday 30 March 2019 ● 7:15 a.m. 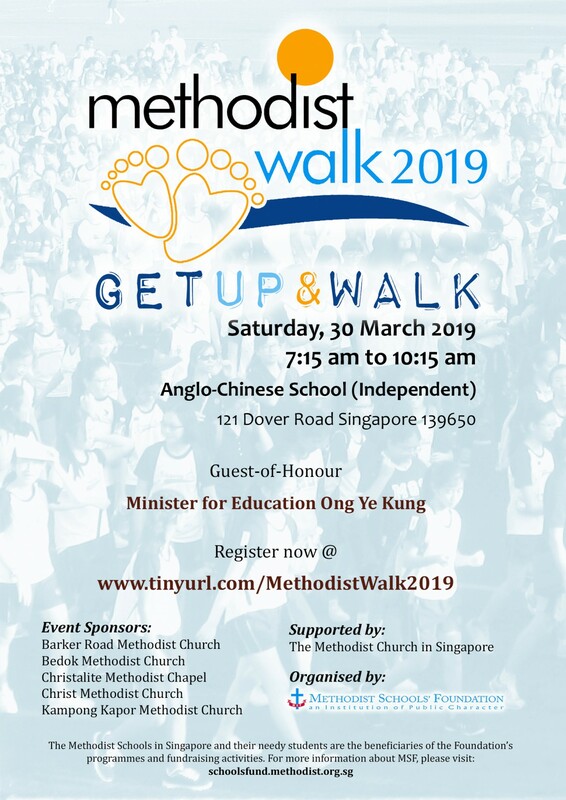 The Methodist Schools' Foundation (MSF), together with 16 Methodist schools in Singapore, will be holding its biennial fundraising walk on 30 March 2019. Pledge Cards will be given out to students. All funds raised will directly support some 22,000 students in our Methodist schools via building grants, education aids and financial assistance. Your generous giving goes directly to provide the children with enriching programmes. In addition, one hundred percent of funds raised by each student for the MethodistWalk 2019 goes back to his/her school. We are thankful to God for the four sponsoring churches of the MethodistWalk 2019. They are: Barker Road Methodist Church, Bedok Methodist Church, Christalite Methodist Chapel, Christ Methodist Church and Kampong Kapor Methodist Church. As an institution of Public Character (IPC), all donations of $100 or more to MSF will get a 2.5 times tax-exempt. Join MSF for a fun day of fellowship and get-together for a great purpose with our Methodist schools, Methodist churches and Methodist preaching points. Volunteers are needed on that day for the following areas: doctors and photographers. Please contact Marcia at +65 64784808 or email her at marcia.vanderstraaten@methodist.org.sg to volunteer. To participate in the walk, please contact your church office or register here. To download event promo e-poster, web-banner, images and others, please click here. To know more about MSF, please click here or watch this video.